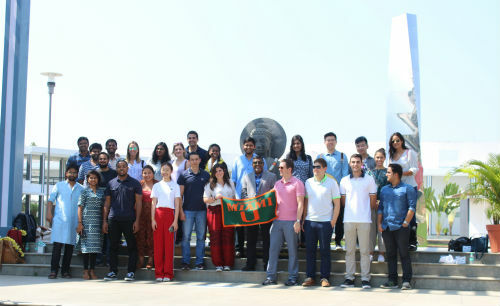 Chennai: Great Lakes Institute of Management, Chennai, hosted 15 students from School of Business, University of Miami as part of an International Experience Learning program, at its campus. Organized every year, the program aims to help students with a greater understanding of India’s culture, traditions, its growing role in world affairs and in particular about the unique Leadership Experiential Action Program — Karma Yoga, offered at Great Lakes. Lead by Dr. Vaidy Jayaraman, Associate Dean, Great Lakes Institute of Management, this year’s program consisted of debate, discussions and an interesting Case Study Challenge on a Retail Store, in which students from the University of Miami were divided into groups and were tagged along students from Great Lakes. The case discussion was followed by a video presentation which showcased Great Lakes – Karmayoga project – how the B school has adopted several villages in and around its campus to empower rural population, in particular – woman upliftment, education of less-privileged children, free medical camps and so on. The session came to an end with entertainment – singing and dance performances by Great Lakes students. Students from both the institutes also exchanged gifts and networked over lunch. 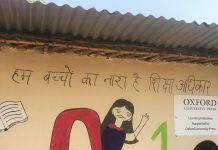 The Miami students also visited the villages in and around the campus, which have been adopted for the Karma Yoga project. The Miami students interacted with the villagers about their livelihood skills and how Karma Yoga program has been helping them to be self-sustainable.